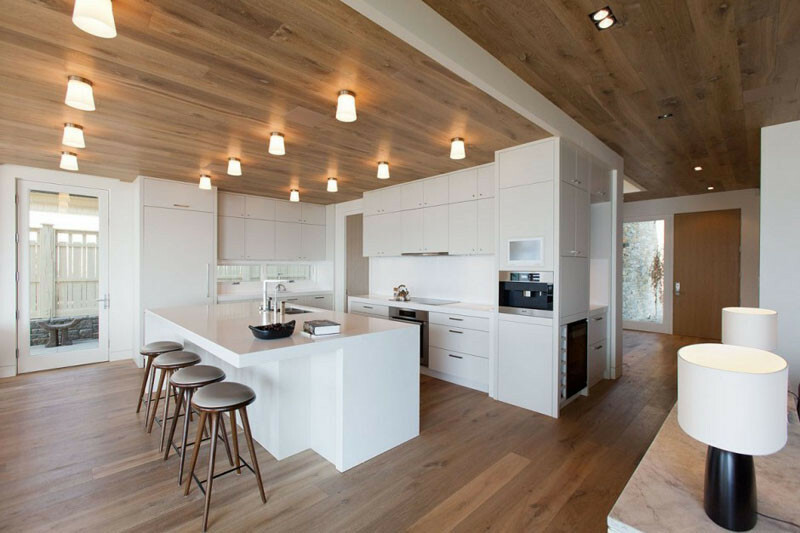 Wood is a great way to add warmth to an interior, but it doesn’t just have to be about floors and furniture. 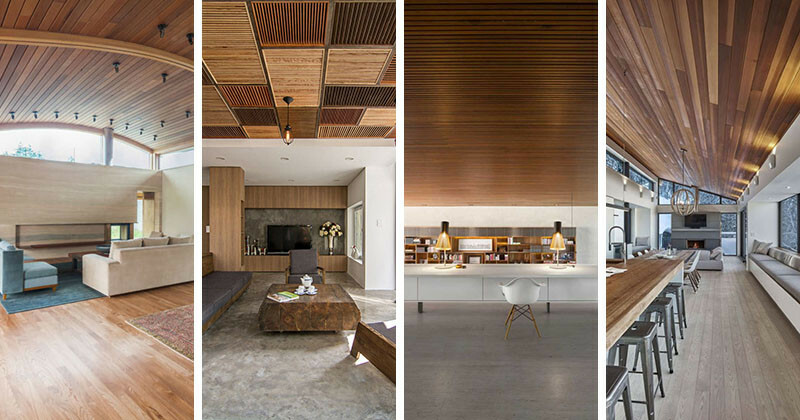 Here are 20 examples of interiors that put wood on the ceiling. 1. These wood window shutters on the ceiling inside a home in Vietnam. Designed by AHL Architects. Photography by Hoang Le. 2. 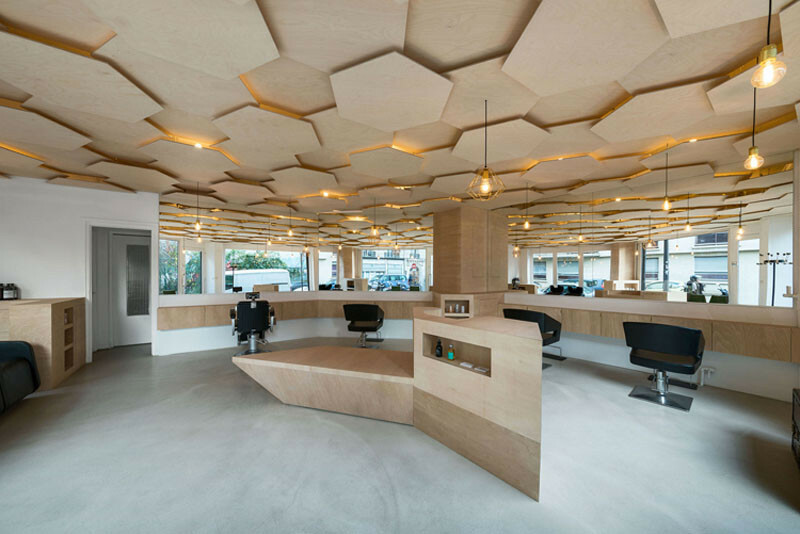 Suspended wood hexagons make up this Parisian hair studio ceiling. Designed by Joshua Florquin. Photography by Matteo Rossi. 3. This wooden ceiling with rows of lighting inside a Canadian cabin. Designed by Robert Bailey Interiors. Photography by Josh Dunford. 4. This ceiling made from wood shingles in an East Hampton home. 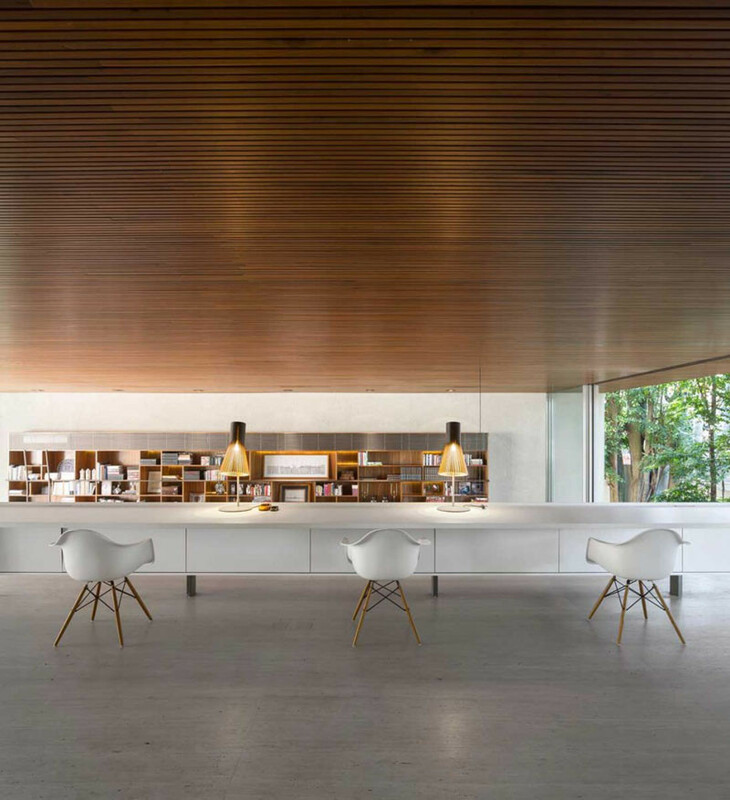 Designed by Bates Masi Architects. Photography by Michael Moran. 5. 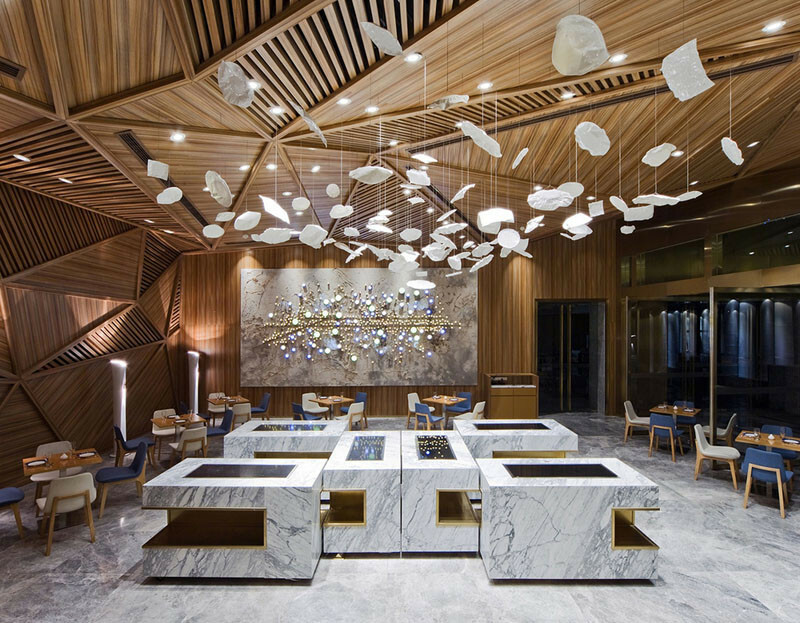 This sculptural wooden slat ceiling inside a restaurant in Sydney, Australia. Designed by Koichi Takada Architects. Photography by Sharrin Rees. 6. This dark wood ceiling inside a home in Mont-Saint-Hilaire, Quebec. 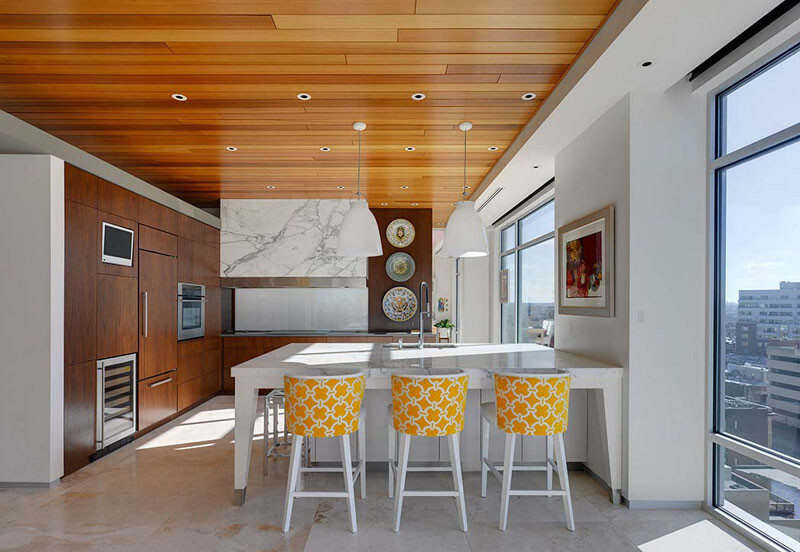 Designed by Blouin Tardif Architecture. 7. These wood ceilings inside this Indianapolis penthouse apartment. Designed by HAUS and LEVEL Interiors. Photography by Ryan Kurtz. 8. 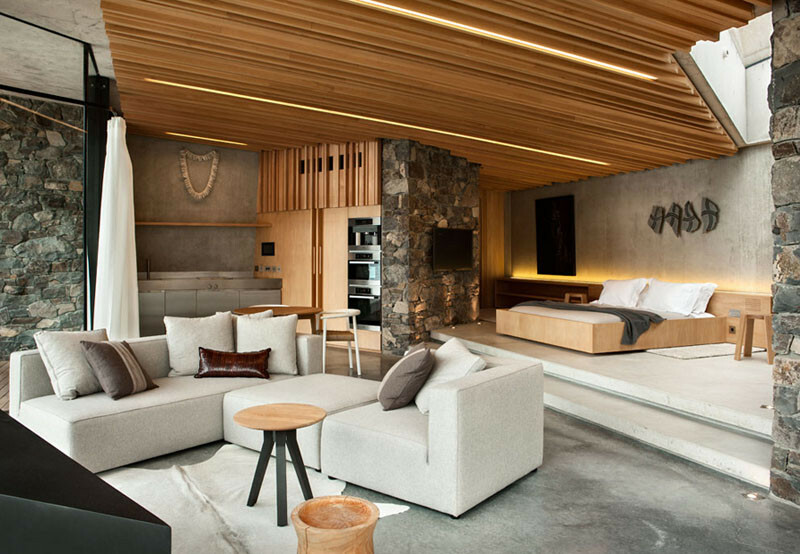 This wood ceiling with hidden lighting in a secluded New Zealand cabin. Designed by Patterson Associates. Photography by Simon Devitt. 9. 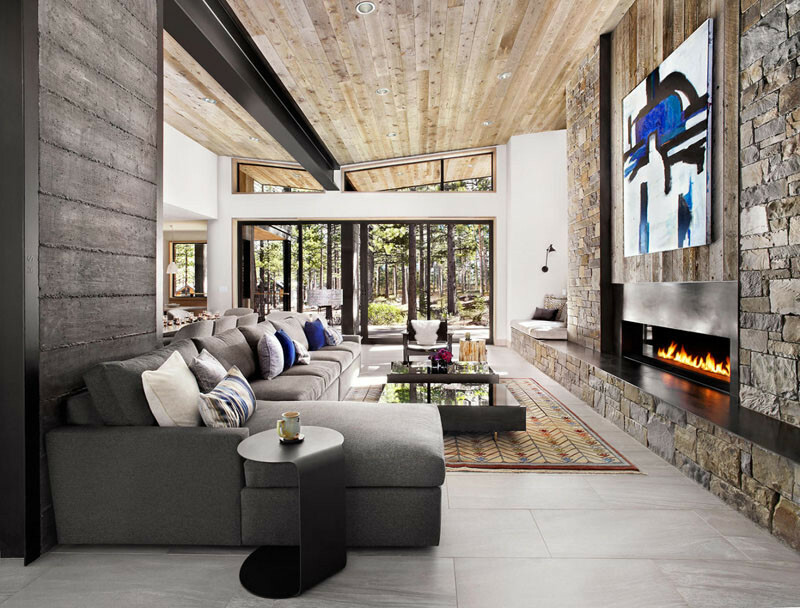 This slanted wood ceiling in a Quebec ski chalet. Designed by robitaille.curtis. Photography by Marc Cramer. 10. This wooden ceiling in a bedroom from a cabin in Canada. 11. 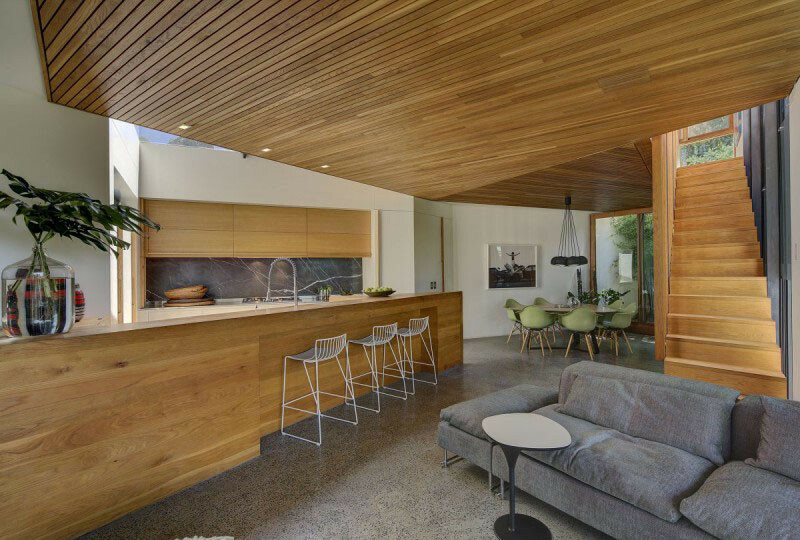 These wooden ceilings in a home in Sydney, Australia. Designed by Fox Johnston. Photography by Brett Boardman. 12. 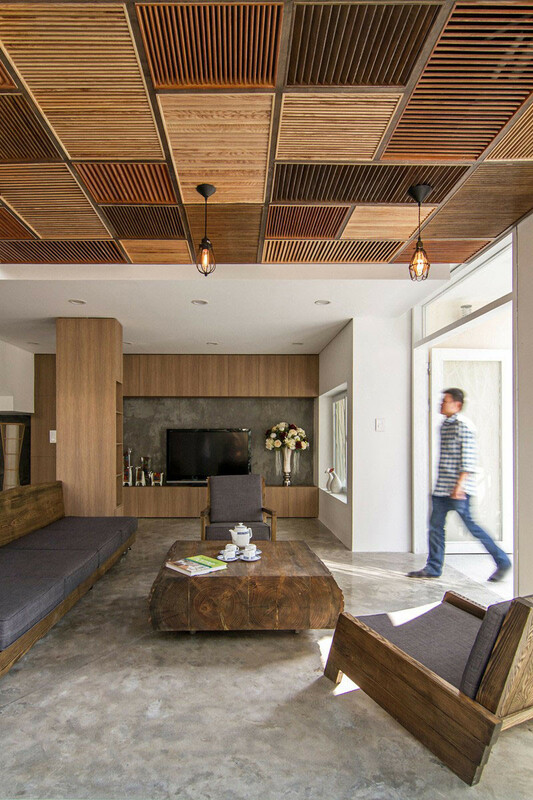 These smooth wood ceilings in a Mexico City house. Designed by Parque Humano. Photography by Paul Rivera. 13. 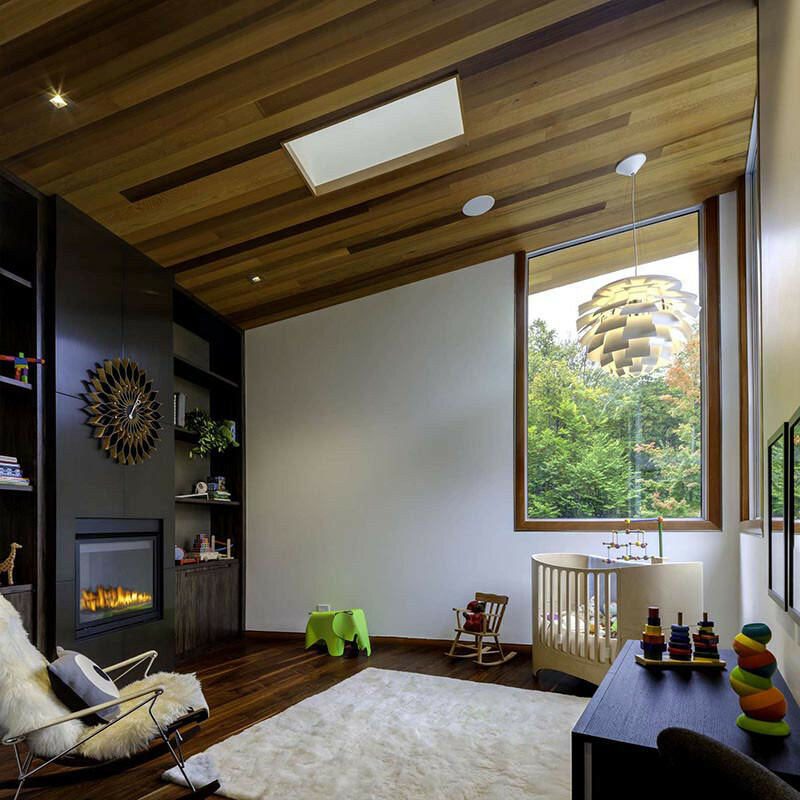 The dark wood ceilings in this baby nursery. 14. 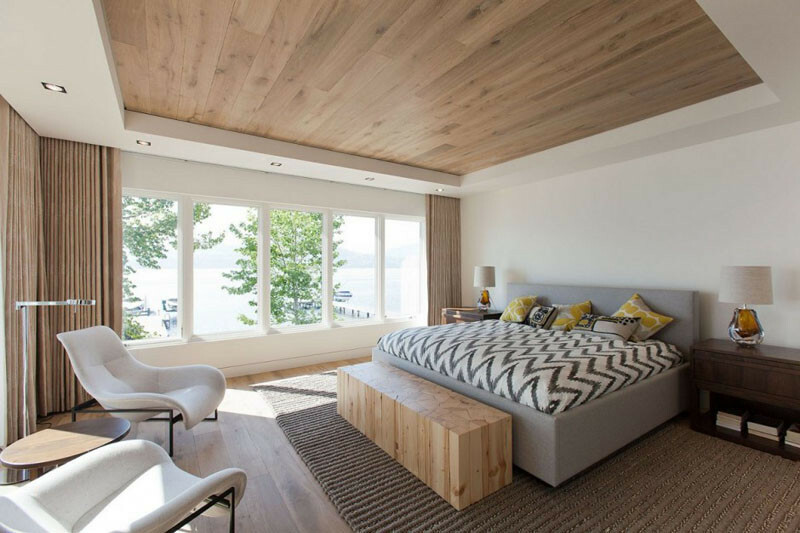 These wood ceilings in a house near Lake Tahoe in California. Designed by sagemodern. Photography by Lisa Petrole. 15. This wooden ceiling in a bathroom in a California home. Designed by Nakhahab Development & Design. 16. 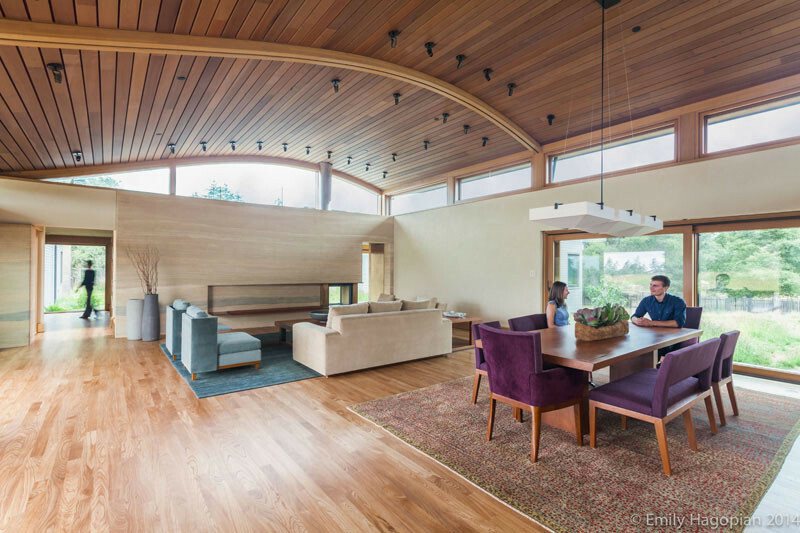 This rolling wood ceiling in a Northern California home. Designed by William McDonough + Partners. Photography by Emily Hagopian. 17. 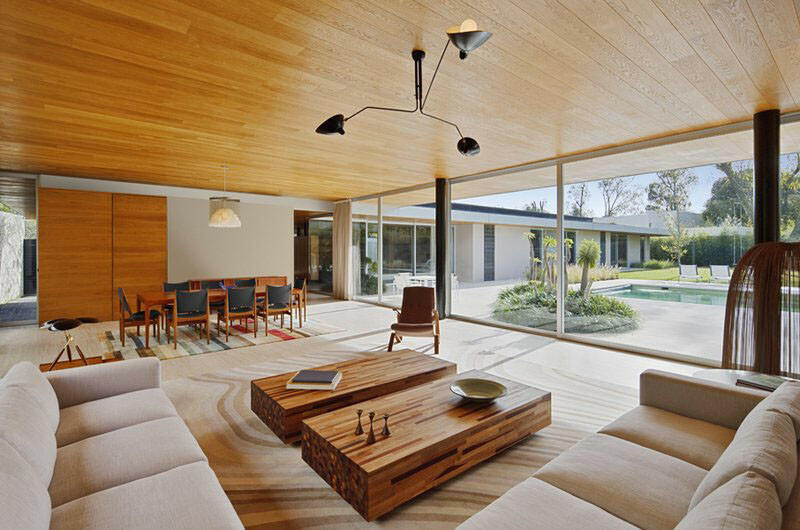 This large dark wood ceiling in a home in Sao Paulo, Brazil. Designed by Studio MK27. Photography by Fernando Guerra. 18. 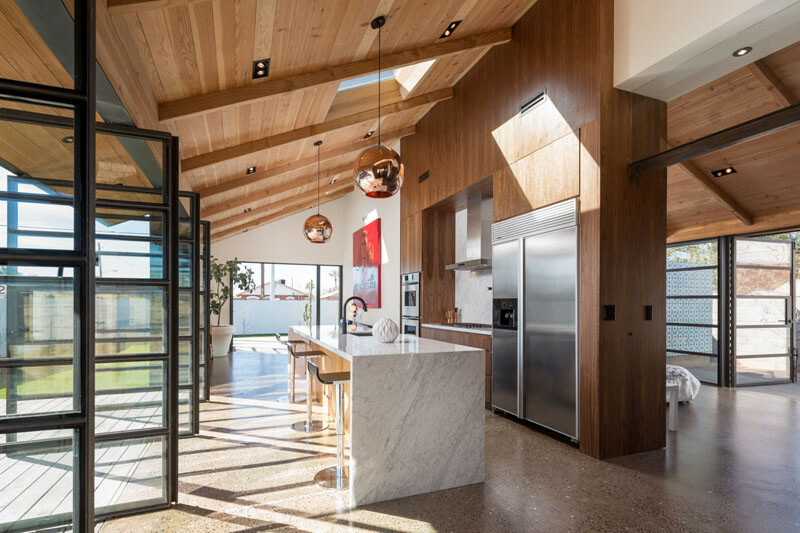 This wooden ceiling in a Phoenix bungalow. Designed by ContraMark and Foundry 12. Photography by Jason Roehner. 19. 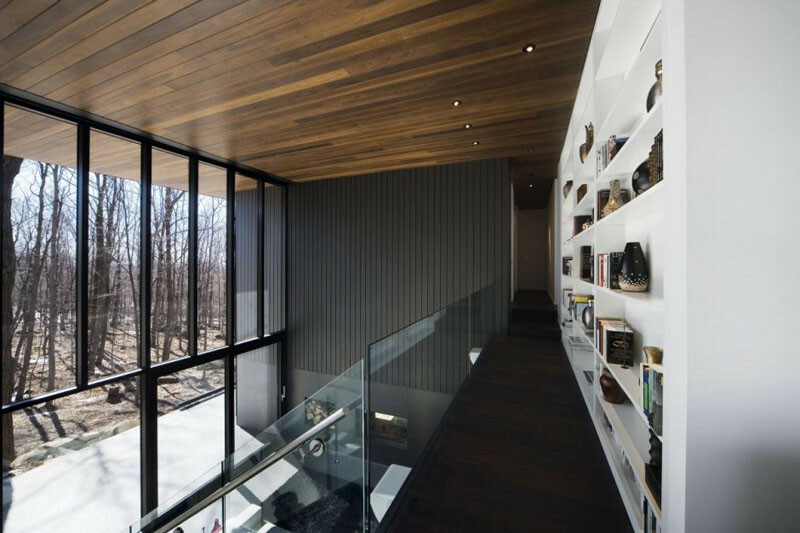 These dark wood ceilings in a home in Canada. 20. 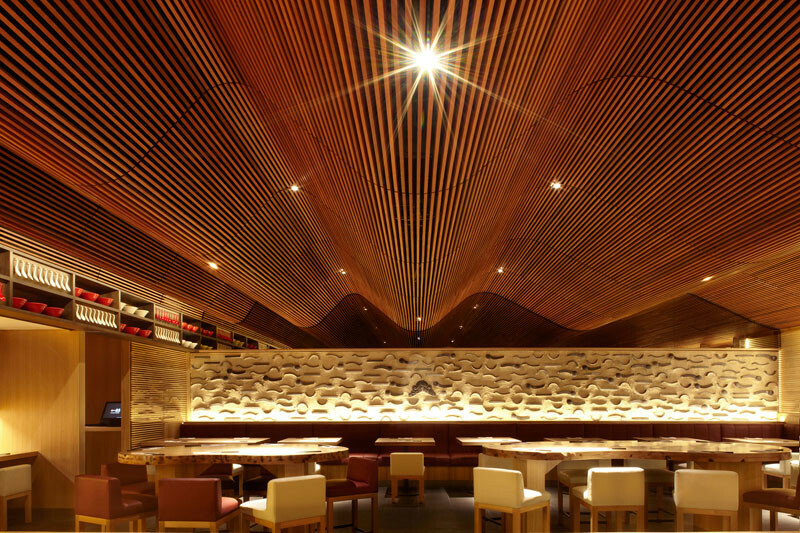 This sculptural wooden ceiling is a creative focal point for this restaurant. Designed by PANORAMA. Photography by Ng Siu Fung.